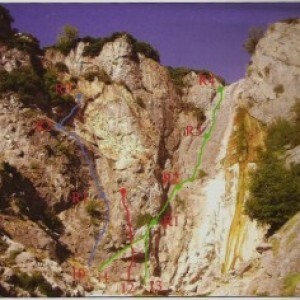 A few kilometers from Arta in the beautiful village of Waterfall opened climbing routes. Arriving in the village of Waterfall continue for the tourist kiosk and from there on foot move to the waterfalls. The slopes are virtually at the point where water drops from waterfalls so to the climb must go period no water (mid-summer-autumn, but better to contact before the visit). The routes opened in 2008 and 2009 by Theocharopoulos Ioannis Anastasiou Marina. 2. The dihedral 4c 20m. 5. The Nymph 5b 28m. 8. Eric 6a + 30m. 9. 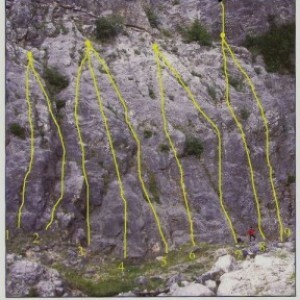 Pinocchio first 6b, second 6b + (necessary rope 70m) 65m. 10. Hard Rock first 6b +, second 6c +, 6c 70m 3rd. 11. The fairy katarrakti1i 4c, second 6c + / 7a, third 6a +, 6b fourth 110m. Needed: 12 quickdraws and rope 70m.